I've been in Germany now for just over a week. My new window to the work-a-day world is no longer an office complex, but rather a home office filled with history books that look out into the back yard and the meadow just beyond. I like this new view. What I lost in office banter and shared lunches I get back in birdsong, church bells, and runs in the forest with a very sweet dog. It would be more fun if there could be a bit of a balance rather than one or the other, but I'd be lying if I said I wanted it to be the office. Things to report: I attended a very traditional German party this weekend, the Richtfest. The Topping, if translated. Basically, when the the walls are up and the roof is finished on a new house, they have a ceremony to thank the builders, ask for protection, and show off the new digs. The carpenter that worked on my friends' house wore traditional dress and delivered the Richtspruch, the Richtfest speech. I couldn't understand it as I don't speak German. No matter. Also as part of this ceremony they (the builders) attached a small tree to building, drank some wine, and threw the glass that held the wine. The glass broke; a good omen. It was all very German. 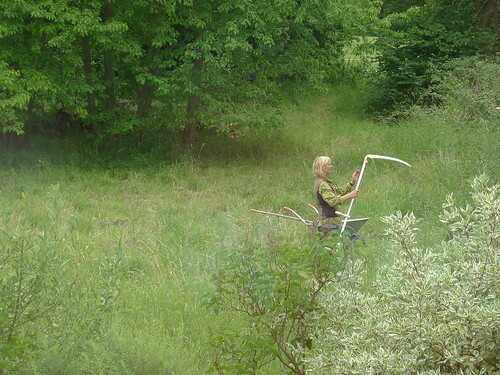 But perhaps not so German as what I saw when I looked up from working late this morning... a woman cutting down the grass of the meadow I look out to with a scythe. A SCYTHE. People still use those. Anyway, I didn't want to scare or startle the scythe-wielding German, so I snuck out of the office, grabbed my camera, and headed up stairs for a better view. Yeah. A scythe. Ok, so broken wine glass = good omen. What kind of omen is woman wielding scythe within view? Must be a good one, right? I mean, she wasn't wearing a hooded black robe or anything like that.